Every new VA or experienced VA has an opinion when it comes to building a successful virtual assistant business. But what really gets under my skin is reading bad advice about what you must do in order to have a successful virtual assistant business. I grit my teeth, shake my head and think, WHY ARE YOU GIVING THIS BAD ADVICE? Don't get me wrong, I know people are just sharing their experiences regarding what has worked for them, but a lot of the advice out there is downright awful. Case and point, some new virtual assistants have been told they need to invest hundreds if not thousands of dollars on a website. That kind of advice makes me crazy. It's just not true! Because what if you're one of those virtual assistants who read the advice from someone about spending hundreds or thousands of dollars on a website and you think to yourself "well I just don't have that kind of money right now" so you don't launch your VA business. 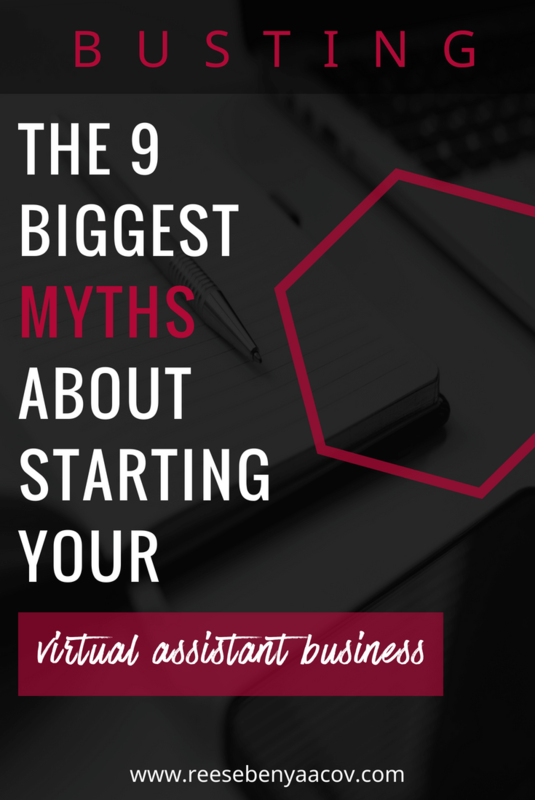 Today I am going to bust those myths and share with you what you absolutely must have in order to build and run a successful virtual assistant business. No fluff. This is the WORST advice ever. It's like telling a baby to start running before he learns to walk. Why on earth would you invest your time and money building a website before you know what business stands for? If you are not clear on the services you are offering and who you are offering those services to, why to waste your precious time putting up a website when you're just going to make significant changes to it. Before you even think about building a website you need to be crystal clear on the core services you are offering, the ideal client that you are going to offer those services to and your message. You are better off creating an awesome LinkedIn profile with lots of recommendations and marketing the crap out of it. That's exactly what I did and I managed to get 10 clients in 12 months with my LinkedIn profile WITHOUT a website. If I can do it, you bet you can too. Once I had a better idea of what services I was offering and my ideal clients, I invested money into a website. I get why people think this is good advice. I mean, if you throw out a wide net into a sea of fish, you should catch more fish, right? Not necessarily, and here is why. If you go out on a boat with a big net, ready to catch a lot of fish, you're going to be very disappointed. Why? Because you're in the wrong spot. You thought this was a good spot but there are no fish to catch, No matter how big that net of yours is, you're going to come up empty-handed. The key is to go where the fish are and the only way to know where the fish are is to front-load all the hard work of figuring out what services you offer and who you offer them to BEFORE you launch your business. One of the best-known phrases in the VA industry goes a little something like this "I provide administrative services to small businesses who need help with the administrative tasks". That line is SO general. What do you feel when you read it? Excited? Compelled to reach out and hire that VA? Probably not. It's too general. If you want to increase your chances of landing quality clients that pay you on contract month after month, I'd encourage you to figure out what you're an expert at and focus on that. Then focus on who needs you the most (hint, it's not every small business owner). Let me give you an example, one of my clients was a birthing coach (doula) but when she started her own family she had to stop working and created a virtual assistant business instead. She was focusing on all small business owners and her marketing efforts were all over the place. She hired me as her coach and together we created a plan where she became the go-to VA for the birthing coach industry. We put together a list of birthing coach conferences and websites and re-wrote her website copy. She knew exactly what services to offer birthing coaches and where to find them because she was one! She went where all the fish were and when she released her net, she got booked solid. Remember, go where the fish are, don't waste your time casting a wide net only to come up empty-handed. The first day I started working as a virtual assistant I updated calendar events in Outlook, wrote travel itineraries in Word and updated an Excel database. I didn't have to learn any new software or get any special training to do work for clients. I worked with clients that were looking for a general virtual assistant to update calendars and databases. THAT WAS IT. I was more than happy to do that work at that time because, HELLO, I was making money in my PJs. As time went on, I become proficient in various software like Mail Chimp, Photoshop, Infusionsoft, and WordPress. I didn't know everything when I first started, I learned as I went along and you will too! To work as a virtual assistant you have to have knowledge of what I like to call the core software, which is Google Applications, DropBox, PayPal, Freshbooks, and anything above and beyond that is a bonus. Go take a look at your local grocery store. Go to the aisle that sells bottled water. How many companies are selling bottled water? What about laundry detergent? Dish soap? Sure, there is competition, you need to work hard to get noticed but competition means that there is a marketplace out there that exists for you to sell your services and create a solid income! The fact that the virtual assistant industry is saturated is a good thing! It means that there are transactions happening on a daily basis (clients paying virtual assistants) and you can piggyback off of the hard work of the virtual assistant veterans that have come before you back when a virtual assistant was a new concept. Today, so many business owners know what a virtual assistant is so you don't have to work hard explaining what the value of hiring a virtual assistant means for their small business. They already know because our industry is so big now. Another important thing to remember is that businesses are popping up every single day. All of these businesses need some form of administrative help so trust me when I say, there is more than enough work to go around for all of us. The key is to be so great that you make your competition irrelevant. To do that you need to differentiate yourself by infusing YOU into your business because there is no one in the world quite like you and that's what your clients will love about you the most. There is much to say about global commerce! I love that there are virtual assistants in lower income countries that are charging $5/hour and I love that there are virtual assistants in the same lower income countries charging $25/hour. I have paid virtual assistants in Pakistan $25/hour and service providers in India $30/hour. To me, it's not about where you live, it's about your skill set and how experienced you are. If you can save me time and do something better than I can do it myself, I'll pay you for it and I'll pay you well. It's worth it to me! But, let's go back to the fact that some virtual assistants are charging $5/hour. I've worked with these virtual assistants personally and I can tell you that they are worth the $5/hour they charge. They don't speak English at a mother-tongue level, they don't understand my vernacular, they need a lot of instruction and they don't get things right the first time. Just last week I went back and forth at least 4 times on a simple Word document with one of my overseas VAs because she wasn't paying attention to detail. That's not to say that virtual assistants from English speaking countries pay closer attention to the details. It's just my observation having been outsourcing to overseas virtual assistants since 2010. Myth # 6 Finding clients online is easy! Telling a new virtual assistant that getting clients will be easy is deceiving and sets up the virtual assistant for disappointment. Finding clients, whether online or offline is hard work! Whenever someone asks me how hard it is to create a virtual assistant business and get clients I always say the same thing. Building your business upon a rock solid foundation is hard work and requires dedication and hustle to succeed. If you have a fire in your belly and don't take no for an answer, you are already leaps ahead of your competition. Your success is directly related to how much effort you put into your business. There is a great quote by Winston Churchill that I'll leave you with and it's "Never, never, never give up". Dude (said in my best West Coast voice), I think it goes without saying that we all are teachers. Every single one of us has something to offer someone else and vice versa. I really hate the word expert and I never use it but if I were to compare myself to some of my colleagues, I might say "compared to so and so, I'm an expert at setting up websites". An expert is someone having or involving an authoritative knowledge on a particular subject. Compared to my clients, I'm in expert in many things, but compared to others, I'm a total novice. It's all relative and your clients are going to pay you for things you know just a little bit better than they do. Stop worrying about becoming an "expert", and start focusing on knowing how to do one thing REALLY well. When I first started out as a virtual assistant I was known as the "scheduler". I could take a 10 city roadshow with over 30 minutes and schedule that bad boy out without sweating. I was just really good and organizing people's time and adjusting for when things inevitably shifted and needed adjustment. So, you could say, I was an expert and managing people's busy schedules and my friend, people pay top dollar for that skill! Why on earth do you think that just because your fresh off the proverbial virtual assistant boat you have to charge less than your counterparts? I made this mistake in the beginning and I'll shout it out from the rooftops that you do NOT need to lower your rates just because you've got no testimonials or clients. If you are damn good at what you do and you can back up your claims, you should absolutely charge whatever amount you feel is in alignment with your work. There is a tendency to break down your yearly salary into an hourly rate but that's not always so smart because you're not taking into account the cost of running your business. Don't be afraid to charge a rate and stick to it. Defend why you're charging what you're charging. Not every client will be able to afford you, and that's okay! You want to find clients that will pay you what you deserve because after all, you have a livelihood to consider. I started outsourcing to virtual assistants right from the beginning. I was so busy running my own business as well as running my household that I had to figure out which projects I absolutely had to hold onto and which projects I could delegate. For example, in 2009 and early 2010 I was doing a lot of social media management for my clients. I vetted all of the content but I outsourced the scheduling of that content. I was able to free up hours of my time each month in order to market my business to bring in more clients. If I didn't sit down and figure out early on how to outsource some of the more repetitive and mundane administrative tasks, I might not have had the success that I did that first year in business. Richard Branson, CEO of Virgin once said that whenever he created a new business, he always worked to try to find someone else to take over for him as CEO. In other words, find someone who can do your work better so you can free up your time on growing your business. Isn't that the whole point of what we do as virtual assistants for our clients, yet we forget to take our own advice. And last but not least, one of the biggest myths in starting your virtual assistant business is that there is just way too much to learn and implement - it's all so confusing and overwhelming! How could I ever do this? Like I said above, building a business is hard work and isn't for everyone but if you know deep down that you were meant to become a virtual assistant and have a location independent lifestyle then you can do this! I built a successful virtual assistant business back in 2010 from the ground up. I started out with one client and within 12 months I had 10 clients! Was it easy? Hell no! Was it worth it? Hell yes! If you want to build your virtual assistant business right, you have got to follow a system. I'd love to show you the exact system I used to create a successful virtual assistant business. Sign up below to be alerted when I launch my online course that will show you the exact steps I took to start my business and grow it to where it is today. You don't have to struggle for months or years the way I did! I am going to teach you how the most successful virtual assistants do it from top to bottom. I'll leave nothing out and the best part? It's going to be so damn afforadable that you won't be able to say no because that's how I roll.